Financial stability is a key factor in a construction manager at-risk project because it is so long and drawn out. The process can last six to eighteen months. The construction manager needs to have the financial resources to sustain a project of that length. On the flip side, an owner has committed to a monetary payout,GMP. That owner must be able to come up with that sum of money when the project is completed. Cost overruns are a familiar dilemma for a construction manager. However, in a CM-at risk delivery system, it’s not an easy fix. Accelerated costs can come from many routine sources. The cost of materials can go up. Vendors and sub-contractors may demand more money. With a GMP, the construction manager is restricted on how he is going to pay for these unexpected costs. This limitation on funds is where CM-at risk agreements lack the flexibility needed in an unpredictable business like construction. Tight deadlines are a reality for construction manager working throughout a CM-at risk proposition, However, delays are inevitable. It can be a hurricane in Miami, scorching temperatures in Phoenix or the inclement weather that’s routine in the Mid-West, Northeast or Northwest. Late shipments of materials and worker injuries can compound construction delays. The construction manager must deal with all these unforeseen situations and still stay on track to meet the deadline. Owners opt for CM-at risk agreements in lieu of the lowest bid selection. That is because owners want a high quality outcome from the construction manager, who is overseeing a large and very complex project. 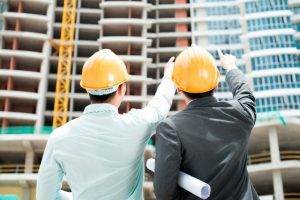 Sustaining that high quality is a formidable challenge for the construction manager because of the length of time that most CM-at risk projects take. If the construction manager doesn’t meet those quality standards, he could be in default.